Heacham is a holiday resort in the county of Norfolk. Situated on the shores of the Wash, it is the English centre of lavender farming and distilling, and boasts 100 acres under cultivation. The village was of sufficient importance in 1086 to have ‘… always 1 horse, 30 head of cattle, 60 pigs, 600 sheep …’, according to its entry in Little Domesday. Partly by clever negotiation and partly by empty threat, Smith had formed a close working relationship with the Powhatan tribes of Chesapeake, in which, Matoaka/Pocahontas was apparently a willing participant. By the middle of 1608, she had become a welcome sight at Jamestown, which was still suffering intermittently from hunger and illness. She visited regularly, bringing much needed food and carrying messages. Even ‘ when inconstant fortune turned our peace to war’, Smith wrote, ‘this tender virgin would still not spare to dare to visit us, and by her our jars have oft been appeased.’ The population of the embryo colony, depleted by about half the original numbers during their first winter, had increased by the arrival of three further shiploads – about two hundred people in all – including the first women. Yet few, including the nominated leaders, knew much about surviving in such a hostile environment. In fact, John Smith was probably the only one of the first arrivals with any understanding of real hardship, or with experience of conflict with non-Christian peoples. His standing among his fellow settlers had risen from tolerated outsider to leading player in the ruling council, even if that leadership was accepted with reluctance. However, the community was still inadequate to the task of settlement. Men with trade skills, or a knowledge of farming, and tools to work the land were needed if the colony was to survive. 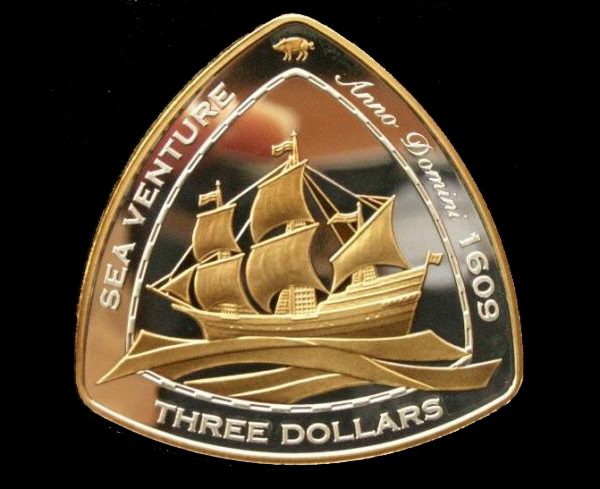 The Sea Venture never made it to Virginia. Driven off course by a storm, she eventually made landfall at Bermuda, where her 150 surviving passengers and crew remained until May 1610. They built two new ships and set sail for Jamestown leaving behind the graves of, among others, Sarah Rolfe and the Rolfe’s infant child. Rolfe and his companions arrived in the colony to find it still beset by starvation and disease. Its survival was gravely in doubt. Towards the end of 1609, John Smith had been badly hurt in an accident with gunpowder – some versions of the story suggest it was no accident – and had to return to England for proper medical treatment. Coincidental or not, his departure saw a breakdown in relations between colonists and natives, and the beginning of intermittent war between them. Matoaka’s visits to the settlement became less frequent and eventually stopped altogether. According to Smith’s journal, she had been told he was dead, and when they met again in 1616 in London ‘she was at first too overcome with emotion to speak’. We know very little about Matoaka’s life during the next three years. She may have married a tribesman, and been widowed. However, in 1613, Samuel Argall, an Englishman on a trading mission, devised a plan to kidnap her and hold her as a bargaining tool in the war. He lured her aboard his ship and brought her to Jamestown. Later, the British took her to the settlement at Henrico, where she and Rolfe met in 1614. Rolfe had meantime enjoyed some success with tobacco planting, while Matoaka had taken instruction in reading and speaking English and in the Christian religion. Rolfe, though ‘no way led (so farre forth as mans weakenesse may permit) with the unbridled desire of carnall affection,’ confessed to a genuine affection for Matoaka, and wrote to the governor of the colony requesting permission to marry her. With our modern cynicism we may doubt his motives, yet his letter rings true, that his overriding concerns were ‘the good of this plantation … the honour of our countrie … the glory of God … and for the converting to the true knowledge of God and Jesus Christ, an unbeleeving creature’. What Pocahontas thought of the arrangement we shall never truly know. Motivated perhaps by admiration for the tobacco planter, or by hopes of an alliance that would bring peace between the colonists and her people, she acquiesced. 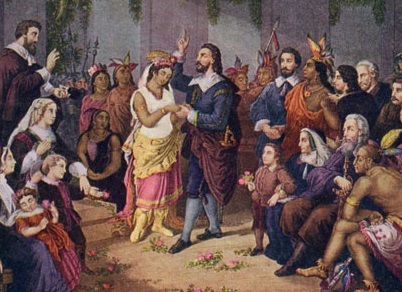 She was baptised into the Christian faith, adopted the name Rebecca, and married John Rolfe in Jamestown on April 5, 1614. Part 3 will follow in a day or two.